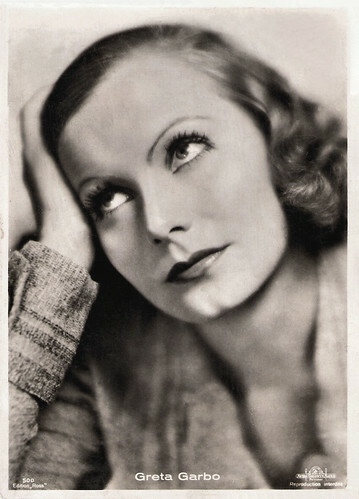 Could Greta Garbo talk on film? 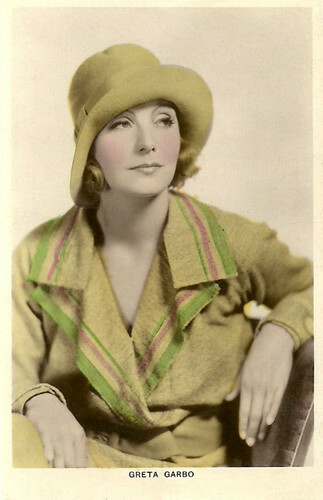 She was part of the Golden Age of the silent cinema of the 1920s, but MGM bosses doubted in 1929 if she with her Swedish accent could survive the talkies. 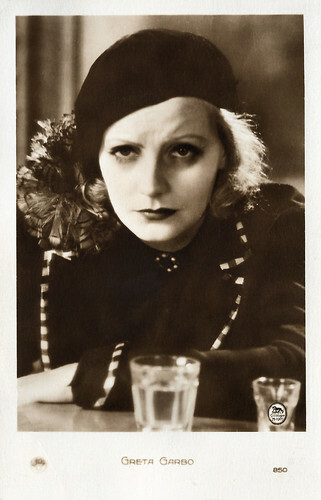 In her first sound film, Anna Christie (Clarence Brown, 1930), her very first line was "Gimme a whisky, ginger ale on the side, and don't be stingy, baby! "For everybody it was immediately clear that her transition to the sound era would be glorious. There were two alternate language versions of the film and according to people who saw both, the German version, directed by Jacques Feyder, is even better than the English one. Dutch postcard by JosPe, Arnhem, no. 34. Photo: MGM / Clarence Sinclair Bull. 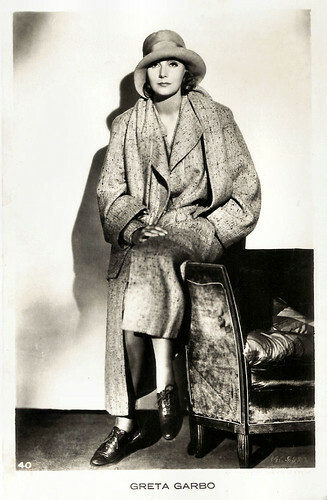 Publicity still for the German version of Anna Christie (Jacques Feyder, 1930). Dutch Postcard, no. 41. Photo: Clarence Sinclair Bull / Metro Goldwyn Mayer. Publicity still for Anna Christie (Clarence Brown, 1930). French postcard by Europe, no. 850. Photo: Metro-Goldwyn-Mayer / Clarence Sinclair Bull. Publicity still for the German version of Anna Christie (Jacques Feyder, 1930). French postcard by Europe, no. 938. Photo: Metro-Goldwyn-Mayer. Publicity still for Anna Christie (Clarence Brown, 1930). 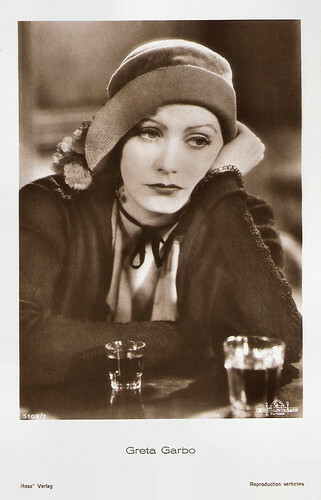 In Anna Christie (Clarence Brown, 1930), Greta Garbo plays a young woman who reunites with her estranged father Chris (George F. Marion), the alcoholic skipper of a coal barge. When Anna arrives in New York, she is a wounded woman with a hidden dishonourable past since she had worked for two years in a brothel to survive. Anna moves to the barge to live with her father and one night, Chris rescues the sailor Matt (Charles Bickford) and two other fainted sailors from the sea. Soon Anna and Matt fall in love with each other and Anna has the best days of her life. Anna Christie is based on the Broadway play with the same name by Eugene O'Neill. The play opened at the Vanderbilt Theater in New York on 2 November 1921 and ran for 177 performances. George F. Marion and James T. Mack (Johnny) originated their film roles in the play. 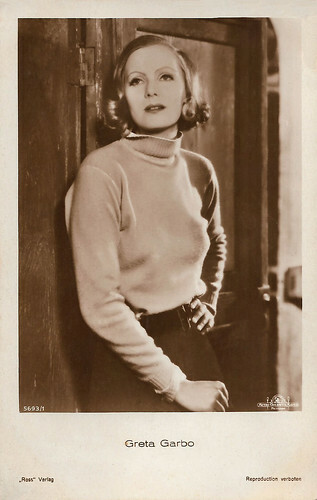 Marion also starred in the earlier silent film version Anna Christie (John Griffith Wray, 1923), starring Blanche Sweet. 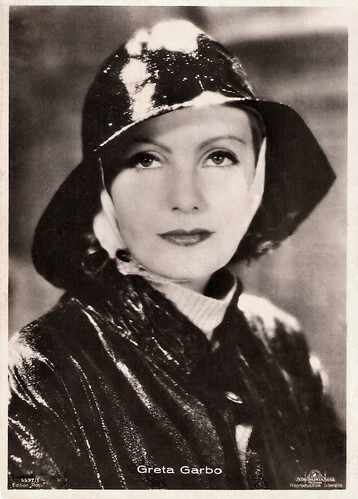 Claudio Carvalho at IMDb: "Anna Christie is the first talkie of Greta Garbo and a heartbreaking story of a young woman that finds redemption through love. I bought the DVD with both versions of 1930 and 1931 [both versions are from 1930, PvY], and the version in English is restored and has additional scenes in the beginning and in the ending; however, Jacques Feyder's version in German is better than Clarence Brown's." German postcard by Ross Verlag, no. 5108/1, 1930-1931. Photo: Metro-Goldwyn-Mayer / Clarence Sinclair Bull. Publicity still for Anna Christie (Clarence Brown, 1930). German postcard by Ross Verlag, no. 5108/2, 1930-1931. Photo: MGM / Clarence Sinclair Bull. Publicity still for Anna Christie (Clarence Brown, 1930). German postcard by Ross Verlag, no. 5290/1, 1930-1931. Photo: MGM. Publicity still for Anna Christie (Clarence Brown, 1930) with Charles Bickford . German postcard by Ross Verlag, no. 5515/1. Photo: MGM. Greta Garbo and Charles Bickford in Anna Christie (Clarence Brown, 1930). German postcard by Ross Verlag, no. 5693/1. Photo: MGM. 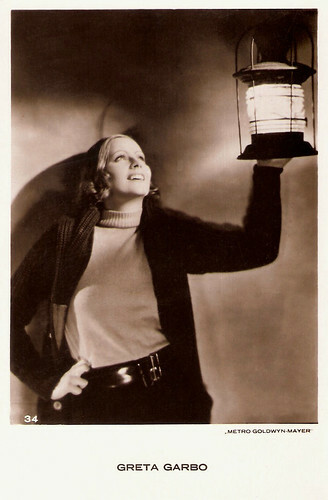 Greta Garbo in Anna Christie (Clarence Brown, 1930). The German version was produced by Metro-Goldwyn-Mayer at their Culver City, California studio in July and August 1930. The English-language original had been filmed there in October and November 1929. 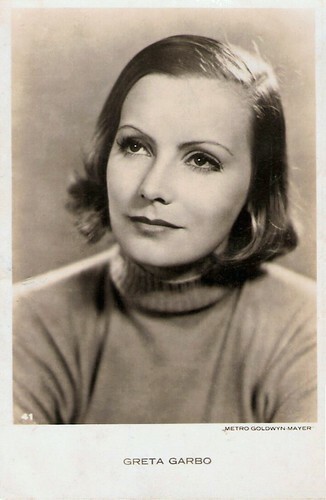 Garbo is the only cast member in both versions and noticeably differs in her appearance in the two. The German dialogue was written by Walter Hasenclever and Frank Reicher, for the most part very closely following Frances Marion's original adaptation. The film was directed by Jacques Feyder using the same cinematographer, Garbo favourite William H. Daniels, but a different crew. "It's better in German", writes Lomza Lady at IMDb: "This version is much better than the English-language version: brisker pacing (although very, very slow by modern standards), generally better performances, and even Eugene O'Neill's somewhat ponderous dialogue is rendered more believable in the subtitles. While Marie Dressler's performance in the English version is fabulous, Salka Viertel's in the German version is also very, very good, just different. 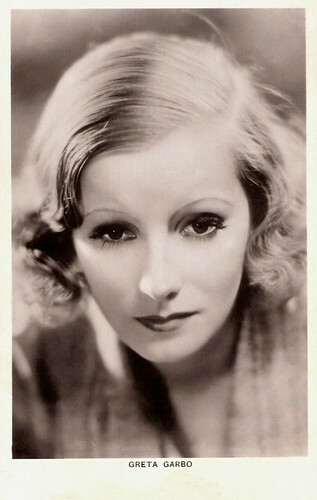 Garbo seems more natural in the German version, perhaps because she was at that time more comfortable speaking German than speaking English. 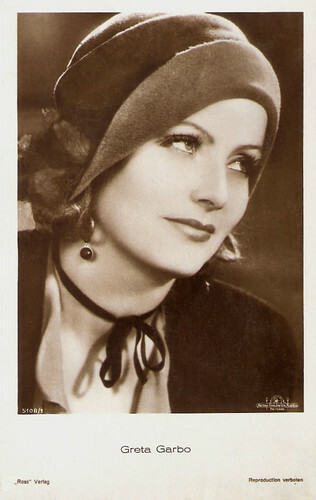 Garbo's acting style may have been a bit old-fashioned, but she was never dull in any film. A true star." Fernando Silva at IMDb: "The atmosphere of the film seems different from the regular MGM stuff made on that era, it looks very similar to French or German expressionistic films from the thirties, well it was directed by a great French director, Monsieur Jacques Feyder, who had directed Garbo in 1929 in The Kiss. Theo Shall is excellent and gives an absolutely believable performance as Anna's sweetheart, the hard-boiled, tough, sailor, who's just a kid in man's body. Also Hans Junkermann gives a very fine performance, as Anna's alcoholic father and Salka Viertel too, as a good-hearted old cheap floozy." Dutch postcard, no. 40. Photo: Metro-Goldwyn-Mayer. Publicity still for Anna Christie (Clarence Brown, 1930). British postcard in the Colourgraph Series, London, no. C 81. Photo: Clarence Sinclair Bull. Publicity still for the German version of Anna Christie (Jacques Feyder, 1930). British postcard in the Picturegoer Series, London, no. 283e. Photo: Clarence Sinclair Bull. 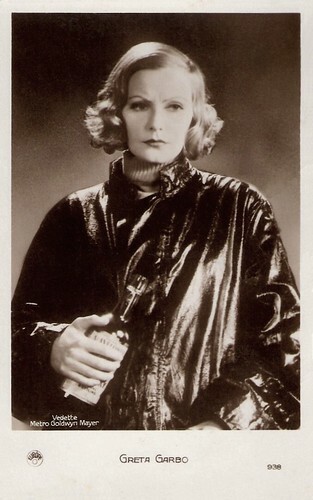 Publicity still for the German version of Anna Christie (Jacques Feyder, 1930). French postcard by Edition Ross, no. 500. Photo: Clarence Sinclair Bull. 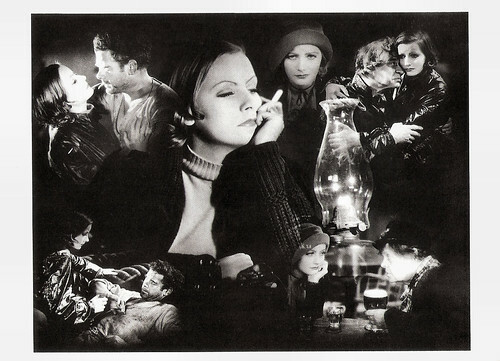 Publicity still for the German version of Anna Christie (Jacques Feyder, 1930). French postcard by Edition Ross, no. 5597/1, 1930-1931. Photo: Metro-Goldwyn-Mayer / Clarence Sinclair Bull. Publicity still for Anna Christie (Jacques Feyder, 1930). Swiss postcard by News Productions, Baulmes, no. 56490. Photo: Cinémathèque Suisse / Metro-Goldwyn-Mayer. Publicity still for Anna Christie (Clarence Brown, 1930). Design: Clarence Sinclair Bull, 1930. Sources: Claudio Carvalho (IMDb), Lomza Lady (IMDb), Fernando Silva (IMDb), Wikipedia and IMDb.